Birds have four basic requirements for survival: food, water, cover, and places to raise young. 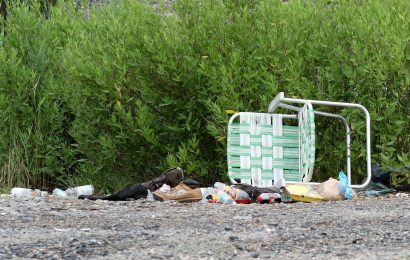 Parks, refuges, and other protected areas fill these needs, and so can you. Just about any property — a backyard, a schoolyard, an apartment-building rooftop, you name it — can provide habitat for birds and other wildlife. In fact, more than 170,000 gardens and other green spaces across America have earned the National Wildlife Federation’s endorsement as Certified Wildlife Habitat. In our April 2012 issue, we featured five of them, and now we’re thrilled to present five more. 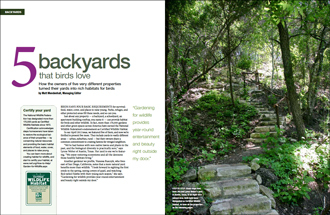 They include yards in vastly different areas — urban, suburban, rural — but their owners share a common commitment to creating havens for winged neighbors. Ernie McLaney learned about birds as a child, from his two grandfathers. Both were backyard birders who were happy to share their knowledge. 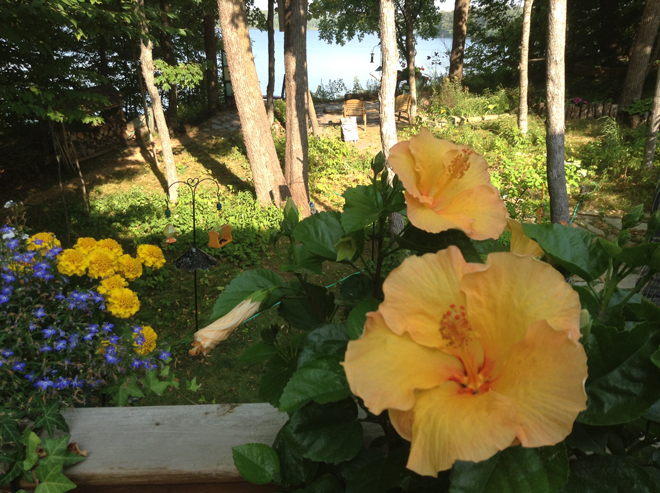 Today, McLaney honors their memories by landscaping his suburban Charlotte, North Carolina, yard for wildlife. His 0.44-acre property has many trees, including oaks, tulip poplars, Virginia pines, dogwoods, and eastern redcedars. 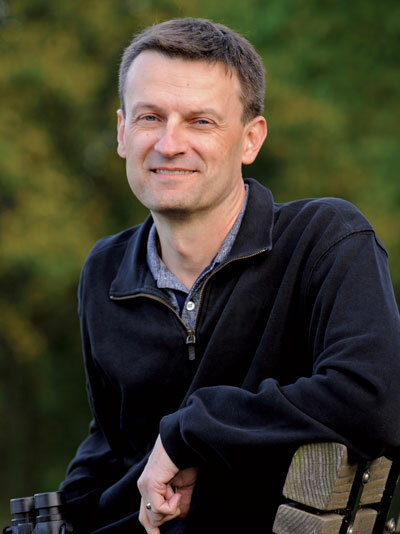 In the last 12 years, McLaney and his wife have planted red bottlebrush buckeye, elderberry, arrowwood viburnum, and other native shrubs, trumpet honeysuckle and other vines, and trees such as wax myrtle, black cherry, and eastern redbud. They continually work to replace open grass with more wildlife-friendly plants. The yard attracts bluebirds, finches, hawks, and nuthatches year-round, and spring and fall visitors have included Rose-breasted Grosbeak, Hermit Thrush, Baltimore Oriole, Ruby-throated Hummingbird, and, once, a surprise from the west: Rufous Hummingbird. 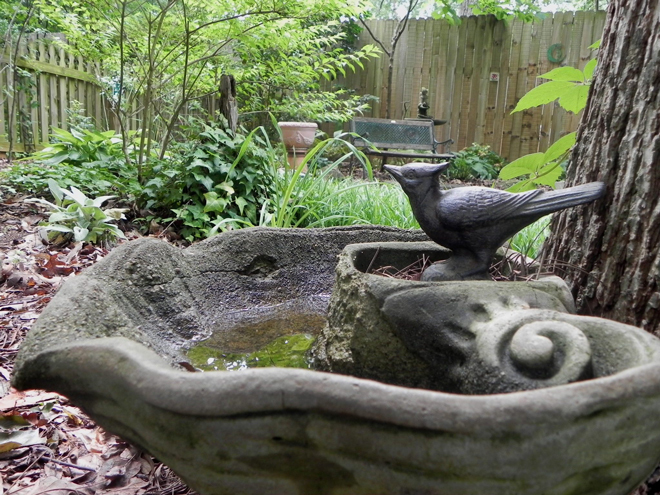 Wildlife can usually find natural foods much easier than a good, clean source of water, says McLaney, so he has six standard-size bird baths, three small bird baths, a large three-tier fountain, and a five-foot recirculating creek made from molded plastic. He also has nest boxes for bluebirds, nuthatches, and House Wrens, and a nesting platform for robins. • Trumpet creeper to attract hummingbirds. • Nine bird baths, plus three drippers and misters in summer, replaced by bird-bath heaters in winter. • Two hummingbird feeders, two suet feeders, three tube feeders, and four hopper feeders. • Two brush piles, several piles of stacked logs, two compost bins, rock piles, and snags. • A perfect view of an occupied Barred Owl nest box just across the back fence. After spending more than 30 years in cities in South Dakota and North Dakota, retired teachers Terry and Darlene Paulson moved a decade ago to a 1.5-acre lot on a lake a few miles from Vergas in west-central Minnesota. They decided on day one to make their yard friendly to wildlife. When they arrived, the property already had many native trees, including maple, oak, basswood, and birch, and they have since added Black Hills spruce. They’ve also planted viburnum, lilac, and other shrubs. The Paulsons also grow native wildflowers such as goldenrod and bluebells, prairie grasses, ground covers, and vines. Their home isn’t far from the popular birding area around Detroit Lakes, which hosts a birdwatching festival each spring. Baltimore Oriole, Ruby-throated Hummingbird, Wood Duck, Tree Swallow, and Rose-breasted Grosbeak visit their yard from spring through fall. And year-round birds include Black-capped Chickadee, Wild Turkey, and four woodpeckers: Downy, Hairy, Red-bellied, and Pileated. “Since moving to the lake,” says Terry, “we now see wildlife as we never did when living in the city. It has become a hobby and a joy to foster and maintain an environment friendly to birds and other wildlife. • Dogwood, viburnum, and other shrubs, and many perennials such as lilies, echinacea, and sedum. • At least five tree species. • Two bird baths, one of which is heated in winter. • A dozen nesting boxes, plus standing dead trees with hollows. • 150 feet of shoreline on East Spirit Lake, home of loons, herons, kingfishers, eagles, and Trumpeter Swans. Christine Southwick’s quarter-acre yard in urban Shoreline, Washington, north of Seattle, adjoins a 16-acre park that features wetlands, woods, and ponds. Over the years, Southwick, who serves as president of the Puget Sound Bird Observatory, has added to the abundance of the neighborhood’s bird-friendly habitat by planting more than 45 types of native plants in her yard. Only a weeping willow and a white pine stood in the lawn when she moved in 12 years ago. 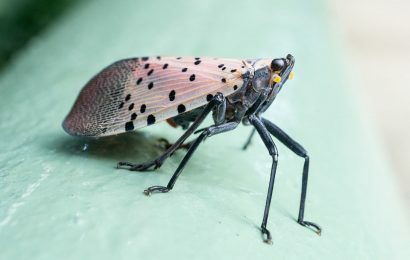 Today the yard has lots of berry-producing shrubs, such as serviceberry, red and blue elderberries, snowberry, thimbleberry, redcurrant, and red-twig dogwood; many trees, including flowering dogwood, native and non-native crabapples, and western redcedar; plus ferns, azaleas, and columbine. Her efforts are paying off. Her yard list exceeds 80 species. Every winter she sees Varied Thrush, Townsend’s Warbler, and Fox Sparrow. 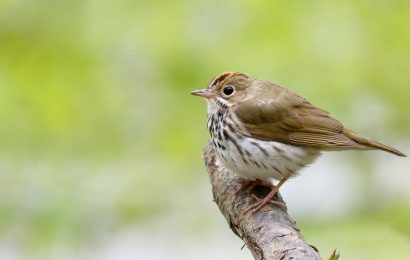 Chickadees, wrens, woodpeckers, and Spotted Towhees are resident, and migration seasons have produced MacGillivray’s Warbler, Western Tanager, and Hermit and Swainson’s Thrushes. A licensed bird bander, Southwick has also banded birds in winter. One year, she recorded no fewer than nine Anna’s Hummingbirds. • Year-round berries from a variety of bird-friendly shrubs. • Circulating fountain, mister, and three shallow catch-basins. • Nest boxes for chickadees and Bewick’s Wren. • Three feeding stations with three or four feeders each, plus two hummingbird feeders, all maintained year-round. • A large cottonwood that adjoins the yard has provided a perch for a Bald Eagle. • Lots of cutting flowers, most of which produce seeds in late summer. Vanessa and Richard Rusczyk moved from a small suburban lot in New Jersey to a 17-acre property on the outskirts of Alpine, California, about 30 miles east of San Diego, in 1999. Vanessa soon discovered a great local resource: the annual Sage and Songbirds Garden Tour hosted by the non-profit Center to Help Instill Respect and Preservation for Garden Wildlife. Native chaparral plants now grow on most of the property, providing lots of wildlife habitat. 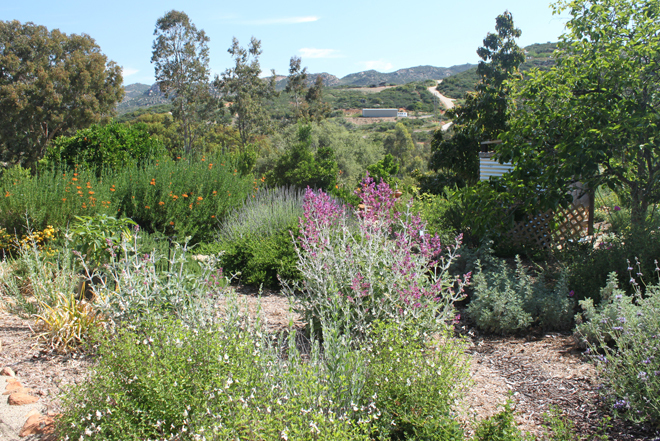 Vanessa gardens approximately two acres, growing a mix of California natives and drought-tolerant Mediterranean plants that do well in the warm, dry climate. 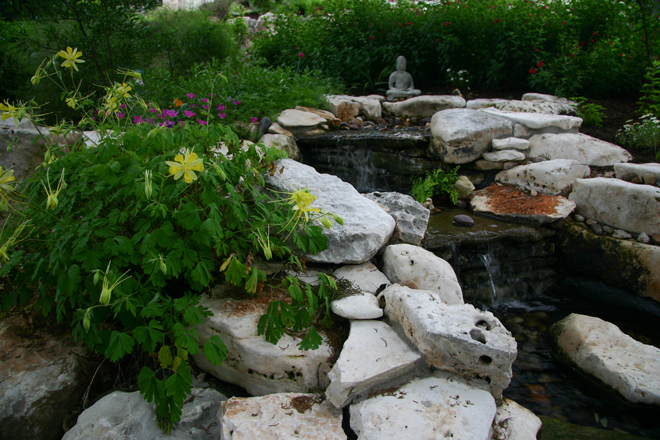 A small pond with a waterfall, a 50-foot manmade creek, and several small fountains provide lots of water for birds. Coveys of California Quail occur almost year-round, as do a few hummingbird species. Bullock’s, Scott’s, and Hooded Orioles nest, and Vanessa has tallied about 40 other species. 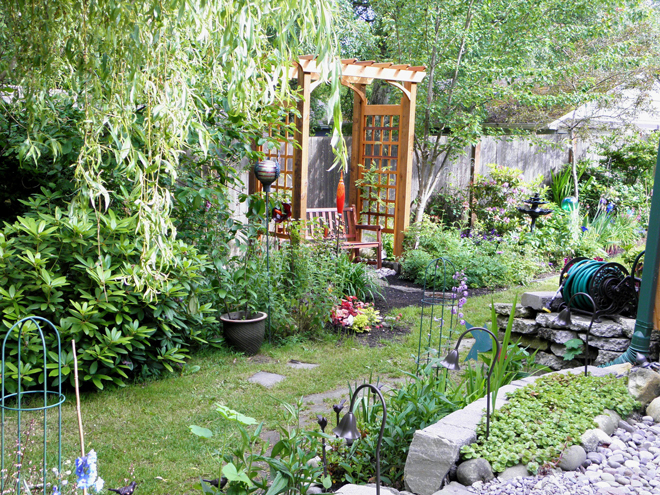 Best of all, she has been able to share her secrets with other gardeners; last year, her yard was featured on the Sage and Songbirds Garden Tour. • Flowers of manzanita plants attract hummingbirds, and other birds and animals eat the berries. • Oak trees provide acorns and nesting habitat for birds. • Ceanothus shrubs offer cover for quail and other ground-nesting birds. • Aloe flowers for hummingbirds. • 800-square-foot walk-in butterfly house hosts native butterflies spring through fall. In 2007, after decades of birding, Lynne and Jim Weber expanded their interest in nature. They graduated from the Texas Master Naturalist Program, intensive training designed to help people become stewards of nature in their local communities. Since then, they have turned their yard and their Austin, Texas, neighborhood into remarkable, valuable habitat for wildlife. The Webers’ home sits on only 0.18 acres, but they also own an adjacent eight acres behind all the houses on their side of the street. Known as Woody Hollow, the property is protected by a conservation easement and is managed as part of the Balcones Canyonlands Preserve system, which protects habitat for endangered species in Austin and Travis County. The yard and Woody Hollow contain more than 100 types of plants, most of which are native to Texas. The Webers have planted trees, shrubs, perennials, grasses, ferns, vines, and ground covers, all for the benefit of wildlife. They’ve counted 13 mammal species, 18 dragonflies and damselflies, 23 reptiles and amphibians, 85 butterflies, and 104 birds. • Ashe juniper, Texas red oak, cottonwood, and other large trees. • Several plants endemic to the Edwards Plateau, including canyon mock orange, a type of hydrangea, and scarlet clematis, a vine with bell-shaped flowers. • More than three dozen perennials, including purple coneflower, common sunflower, and tropical milkweed. • Dogwoods, hollies, and other shrubs. • Last winter, hummingbird feeders attracted an overwintering Rufous Hummingbird. 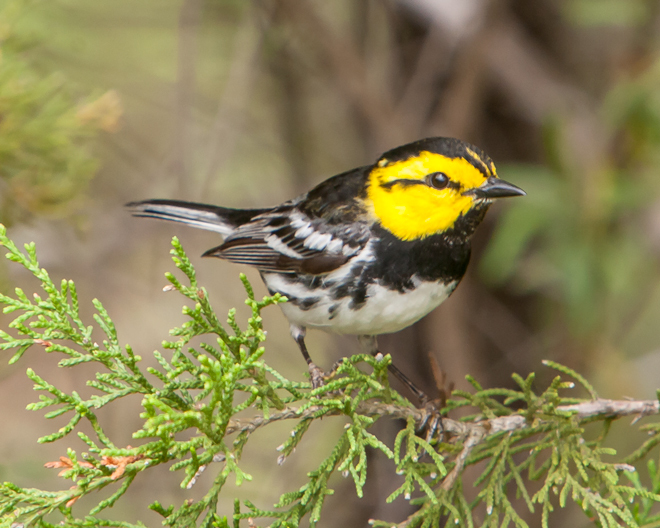 Not only is the endangered Golden-cheeked Warbler one of North America’s rarest birds, it’s the only bird species whose population nests entirely in the state of Texas. The warbler spends the winter in southern Mexico and Central America, but its breeding range is restricted to 33 counties in central Texas, including Travis County, where Jim and Lynne Weber live. The warbler prefers steep wooded canyons possessing a mix of mature ashe juniper (also known as mountain or blueberry cedar) and deciduous trees. It uses the long, stringy juniper bark along with spider webs to build its nest. Decades ago, cedar eradication and wildfire suppression destroyed much of the bird’s habitat, and now urban sprawl is a primary threat. To help, and to protect habitat for other native plants and animals of the Texas Hill Country, a system of habitat preserves known as the Balcones Canyonlands Preserve was created in 1996. Woody Hollow, the property the Webers manage, is part of the preserve system. You can read more about the Balcones Canyonlands Preserve at www.co.travis.tx.us/tnr/bccp/bc_preserve.asp.